If you've ever seen late-night mastermind Conan O'Brien venture into the real world and interact with the commoners, you know you're in for a treat whenever it happens. Turns out the head of Conan's IT department, Chris Hayes, is a Taco Bell superfan, eating it at least three times a week. As Conan is a benevolent boss, he decides to make Hayes' dream come true and take him to Taco Bell headquarters in Irvine, Calif.
We get an interesting glimpse behind the tortilla curtain, where we see how the magic happens. But more important, comedy ensues as Conan and Hayes rollick through the chalupa palace, interacting with food taste testers, trying new creations in the "Innovation Kitchen" as well as inventing new ones like Conan's Irish-inspired concoction, "The O'Taco." It's not all flattering to the brand, but it ends up putting the chain in a good light just because it's so entertainingly honest. 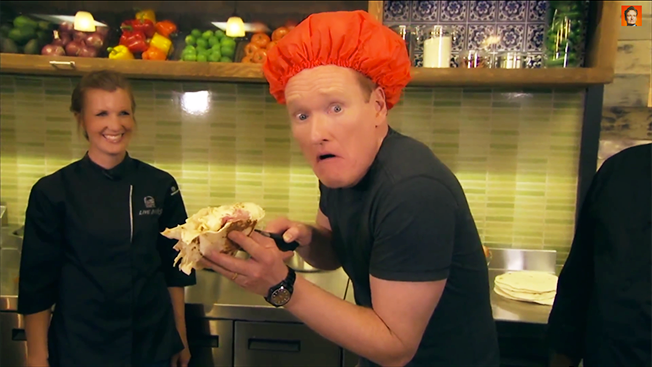 So, sit back and enjoy this hilarious tour of Taco Bell HQ, with your guide, Conan O'Brien.